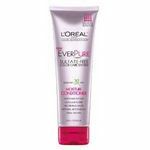 I used to use this once a week as a kind if a deep conditioned for my hair. I alternated it with the daily leave in conditioner I was using at the time. The main reason I did this, was because it required that you leave it in your hair for a few minutes, and I really don't like standing around in the shower that long, without actively washing. It's my own hang-up though. I would have used it everyday, if I wasn't ultra-lazy. It was a very nice moisturizer and hair re-builder. I loved it's creamy, silky, texture! I haven't seen it around lately, and I miss it! 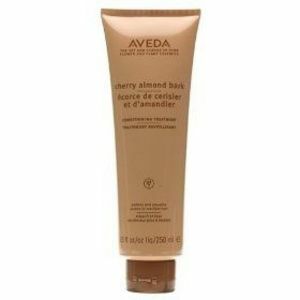 Effectiveness Aveda Cherry Almond Bark Conditioner does exactly what you want a conditioner to do. It leaves your hair feeling soft, and easy to comb through, which helps with de-frizzing as well, if your hair is frizzy. Scent I really liked the natural scent of this conditioner. It may be too odorous for a person who can't handle scents at all, but it's not overpowering like most conditioners. My sister gave me Aveda's Cherry Almond Bark Conditioner to try and I love it. This conditioner, like other Aveda products, smells absolutely incredible. A lot of scented hair products can smell overpowering, chemical-like, or like an awful perfume, but not this one. The Cherry Almond Bark smells really natural and relaxing. This conditioner also works really well, especially if you have time to put it on your hair and let it sit for a few minutes before rinsing it out. I love that it is like a quick deep conditioning treatment in the comfort of your own home (and on your own schedule). 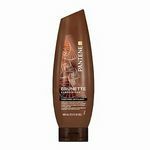 It is great for dry or damaged hair, as it makes it much more silky and smooth after one application. Sadly, I believe that for some reason Aveda has discontinued this particular line, which is a shame because it's such a great conditioner. Hopefully they will bring it back to stores! Higher price than post, but totally worth it! I'm not going to lie - I found a half used bottle of this conditioner left in the locker room of my local gym...so I thought I'd try it out instead of using the shampoo/conditioner that the gym supplies (which actually does so much damage to your hair). It was just the conditioner when I first tried it. I used the regular gym shampoo, then rinsed, and then applied this almond bark conditioner to my hair. I let it stay in for about five minutes, then rinsed it out. First of all, the scent is AMAZING! I was in heaven, which is probably why I left it in longer than I normally do with conditioner. Second, when my hair finished air drying (I try to avoid blow-drying), it was super soft and shiny and sleeky. I felt like I just got my hair done at a professional salon. Imagine what it would have felt like if I used their line of shampoo as well!? And so, that's what I did - I went to my local Aveda store and bought their shampoo and conditioner. 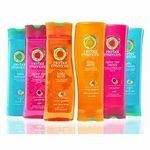 However, I must say this product is no longer sold at Aveda stores - you might find it on other online websites though. A good replacement is any of their hair care lines. Aveda has amazing products that are pricier than others, but they actually work and a little goes a long way! Aveda Cherry Bark conditioner has everything one could want in a conditioner. Don't waste time and money trying lesser products if you come across this winner. First and foremost, it takes ultimate care of your hair. If you have dry or damaged hair, start using it and notice a difference almost right away. If not, use it to keep your hair looking fantastic. It smells fantastic. The almond fragrance is subtle enough not to get old, unlike a whole host of conditioners that either smell like an herb factory exploded or like an old lady's floral perfume. Hell, if they marketed its fragrance in a spray bottle as a deodorizer, I'd use it around the house. Finally, it really moisturizes without leaving any oily residue. You can use it as often as you shower or bathe, even three times a day, without experiencing any filmy or oily residue. I'm not sure about Aveda's marketing strategy; I haven't seen it around lately, and I really hope they haven't phased it out for some other new-age scent with the same winning formula under the hood. If you have heavily chemically treated hair, this is the one for you. 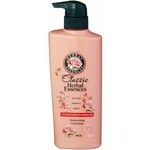 It smells wonderfull and also repairs dry, damaged hair in minutes. I highly recommend this and have not found a better one- EVER.